Indian ethnic fashion and couture is making its firm hold in the foreign markets. Indian cloths and fashion accessories have seen a major rise in the sales and revenue in the last few years. India with its heritage designs and colourful silhouettes has always been in great demand. 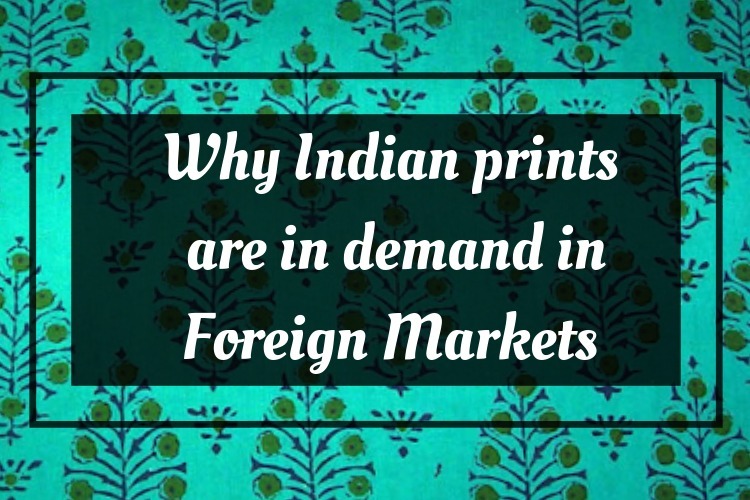 Prints which are on verge of extinction in India have found a great market in the foreign countries – prints like Ajrakh, Ikat, Kalamkari, Bagh, Dabu to name a few. The India ethnics are a collective of various structures and shapes, which give the fabrics a unique identity. The structures are intricate and created to give the fabrics a well derived pattern. The inclusion of large motifs, symbols, figures, shapes add to the heritage value. Indian designs are just not in increasing demand because of the structures and motifs seen in the couture, but also because of the range of colour pallet which is gnarling the attention in major western markets. Colours have always played a major role in Indian fashion. It is all about bright hues and different colour spectrums in one. With major fashion events such as the Lakme Fashion Week, global exhibitions and the increasing participation of designers coupled with the publicity has helped in attaining more buyers from the western markets. The Indian ethnic market has grown by CAGR of 8% to reach $19,600 million by 2019. And with the increasing force of e-commerce, it is more accessible for the craftsmen who want to sell their work easily to the foreign markets and customers. The growth in digital products has also been a major driving force for start-ups to expand and boost their business in foreign countries. The Indian community is growing to become a part of the world milieu. This naturally makes the Indian clothing more prominent, making their way in more and more wardrobes. The NRI community staying away from their motherland exploits every occasion to stay connected with India and vitally through its fashion, making it more visible to the locals, boosting the designs and art. Lately, ethnic Indian prints have culminated into the western clothing outfits forming a fusion of Indo-western clothing, opening a newer branch of fashion and opportunities. This culmination has also been a major factor included in boosting the Indian print industry. With many foreign brands and fashion giants exploring Indian prints by fusing them into their western prints, India is sure to reach and even bigger global scale.